Read Terry Ettinger's Let's Get Growing column every week in your Eagle Community Newspaper! Since the spring of 1996, I've addressed hundreds of lawn, landscape and garden-related questions posed to me by callers to "The Weeder's Digest", "Garden Journeys," and directly to my office through this weekly question and answer column. At right is a list of topics that I've addressed during the past couple of months. To make sure you don't miss next week's column, call 315-434-8889, ext. 342 to subscribe! Or, go to the Eagle Newspapers website by clicking on the link below. Scroll down for additional information, links to other websites and color photographs in support of recent "Let's Get Growing" columns. Letting a seedbed go unplanted, or "stale" for two or three weeks after it's turned in April, at right, gives the root pieces and seeds of various weeds time to sprout. These small sprouts can then be turned under, disrupted and hopefully killed by light raking, or killed outright with an application of a herbicide such as glyphosate, the active ingredient in Roundup and other non-selective products. Repeating this process of tilling and delayed herbicide application two or three times between April and June, followed by the planting of a cover crop can go a long way toward the preparation of a practically weed-free strawberry bed the following spring. While I wish I could say that there's an effective, "organic" weed control product registered for use in New York State that works as well as synthetic, non-selective herbicides containing glyphosate as the active ingredient, there simply isn't at this point in time, as a demonstration project at the University of Minnesota illustrated a couple of years ago. As I said in the column, "don't be afraid to experiment" in your (new) garden! After all, what's the worst possible thing that could happen . . . . ., losing ten dollars worth of tomato transplants? 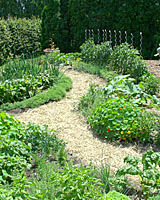 As a perfect example, you don't have to plant stuff in perfectly straight rows - be creative, at right! 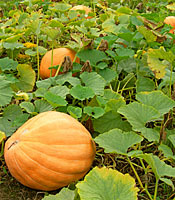 The faculty and staff at Cornell University have developed a number of excellent vegetable and fruit growing resources. To access them, click here. Because the various squashes within a given species readily cross pollinate one another, saving seed from one year to the next isn't a good idea - unless you want to see what kinds of weird-shaped fruit you can grow (which can actually be sort of fun, if you've got room in your garden, at right). To see just how weird some varieties of squash can look, and for information on growing "real" jack o'lanterns and giant squash, click here. 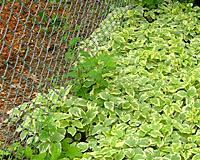 Though the weed of concern addressed in this column is goutweed, at right, the management strategies are the same regardless of whether you're dealing with invasive weeds and/or aggressive ornamental groundcovers (including English ivy, vinca/myrtle and/or pachysandra). As pointed out in the column, the best way to prevent these invaders from entering your landscape and garden beds is to maintain a mowed strip of lawn between the beds and property line, below left. Moving planting beds into your property can also result in more effective visual screens in a shorter period of time and often with far fewer plants. If, on the other hand, your beds are already in place, you can attempt to manage the invaders with a diamond hoe and/or herbicides applied using a "glove-in-glove" technique. 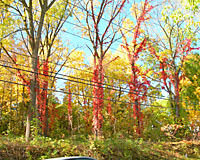 The picture at right is of a colony of red-leaved Virginia creeper that's become well-established in a small woodlot near the intersection of Thompson Road and Kinne Street in the Town of Dewitt. This picture, at least to me, illustrates why it's probably not a vine you'd want to plant in a residential landscape - unless you live in a huge mansion! In my opinion, there's no such thing as a "good" or "bad" soil. 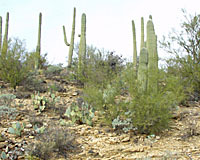 After all, cactus seem to grow just fine in soils that look pretty "bad" to me in the deserts of Arizona, below left! 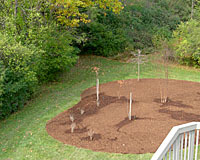 However, in our Central New York landscapes and gardens, the best way to "improve" sticky, clay soil or excessively dry, sandy soils is to add organic matter. Click here so that I can show you a simple way to determine the texture of your soil, as well as options for adding organic matter to the soil in your landscape and garden.